Proudly meat free. A crispy, crunchy classic. Source of fibre. Low in saturated fat. No soy. Vegan. A real family favorite at tea time. Serve Vegan fingers in a butty for a real crowd pleaser! 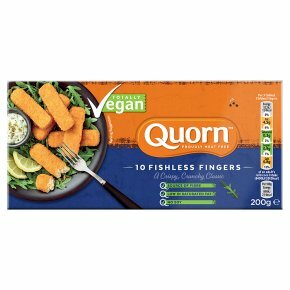 Sustainable nutrition Quorn products contain mycoprotein, which is nutritionally healthy because it's low in saturated fat. Mycoprotein is footprinted by the Carbon Trust, so is less harsh on our planet's resources. 15 MinPreheat oven and baking tray to 220°C/Fan 200°C/Gas 7. Cook on the middle shelf. 10 MinPreheat grill. Grill on a medium heat, turn frequently. Remove all packaging. For best results oven cook.All appliances vary, these are guidelines only.Check product is piping hot before serving.